I would like to apply this to Clare Graves' model of psychosocial emergence, but it doesn't quite match the pyramid. It is obvious that the Tribal level developed Technologies of Survival. In fact, many of those things would have to be pre-Tribal -- pre-human, in fact, when it comes to things like hunting and defense. But the Tribal level is where these things are most thoroughly developed in a human sense. I think it is also obvious that it was with the emergence of the earliest Heroic levels that Technologies of Social Organization emerged. Farming, war-making as we now understand it, government as we continue to practice it, architecture, religion, market trade, etc. were all developed at this level. However, it seems that the Authoritative level mostly only managed to firm up the Technologies of Social Organization -- though certainly some Technologies of Prosperity were founded (and some were also founded earlier, during the Heroic level). But Technologies of Prosperity really took off during the Entrepreneurial level. Technologies of Leisure can also be seen to have been established earlier, but again, things really take off in the transition from the Entrepreneurial level to the Egalitarian level. Finally, Technologies of the Self have developed during the Egalitarian period, and are a culmination of their narcissism and decadence. That takes care of Tier 1. The rapid development of each may be more attributable to Renaissance periods between each, or even the first-flowering of each level, but we also see seeds planted earlier. Of course, Gravesean psychology is itself "messy" -- it doesn't really go through perfectly pure stages. The cosmos is messy, life is messy, and we shouldn't expect perfect delineation in our psychological or social models, no matter how much we would like them to do so. 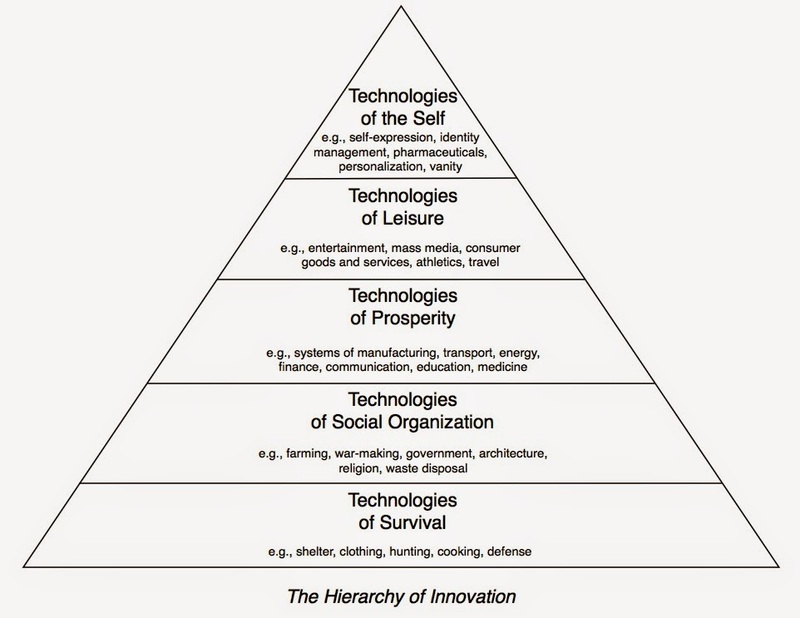 Still, I would like to see a similar Hierarchy of Innovation developed that could map better on Graves' levels. This is close, but doesn't quite make it. Also, we would have to deal with Tier 2. Obviously the Technologies of Tier 2 Survival would be quite different from those of Tier 1. What does it mean to be in survival mode for Tier 2? What technologies help with that? And what are/will be the new Technologies of Social Organization? One would expect new institutions to arise. I would argue that they would all be based on scale-free complexity. Tier 1 developed on the basis of hierarchy. Tier 2 will develop on the basis of scale-free networks. The results and conclusions surrounding The Trolley Problem are highly suggestive about what arguments may or may not work when one is trying to persuade people about something they consider to be an ethical situation. In The Trolley Problem, you are faced with the following pair of ethical dilemmas. There is an out-of-control trolley barreling down the tracks toward five people. You can switch the track, but if you do, you will kill one person on the track. Do you switch the track, allowing five to live, but allowing one to die? Or do you not interfere? There is an out-of-control trolley barreling down the tracks toward five people. You can push someone onto the track to stop the trolley, but if you do, you will kill that person. Do you push the track, allowing five to live, but allowing one to die? Or do you not interfere? Most experiments show people will switch the track, but won't push the person, even though the outcome of one dying so five may live is the same. Why the difference? People view the death of the one from scenario 1 as a side effect of saving the five, while the death of the one from scenario 2 is an intention. That is. in scenario 2, we are using a human being as a means to an end (something Kant argued we should never do, about which it seems most people agree). This is on the case in scenario 1. This suggests something about how we ought to make arguments about things like the minimum wage. Most arguments I read about why we should not have a minimum wage involve the argument that it will result in the unemployment of some even as it increases the wages of others. How does this relate to the Trolley Problem? Simple. The economist who makes this argument is making the argument that the 1 should not be sacrificed for the 5. They are saying you should neither switch the track nor push the man. But most people do not accept that. Most people think it is okay for the track to be switched. And people view increasing the minimum wage as switching the track. You don't intend to unemploy people with it; it's just a side effect of helping others. Economists, if they want to make a strong argument that will persuade people to oppose the minimum wage, will have to frame the argument as the minimum wage pushing someone onto the tracks. That is, that the effect of unemploying some people is not a side effect. We have to frame the argument such that people view it as using some people as a means to help other people. The number of people being used by politicians when they raise the minimum wage is quite large, in fact. Not only are unskilled workers being used by politicians to get votes and to raise the incomes of a handful of people, but employers are being used as well. Politicians who raise the minimum wage are using people as means, not ends. They are treating low skilled workers as means, and they are treating business owners as means. Politicians are always pushing people onto the tracks, but claiming they only switched the tracks. We need to stop agreeing with the politicians about what it is they are doing. Imitation or Invention in the Arts? On his Italian Journey, Goethe attended a meeting of the Academy of the Olympians. It appears to have been something like a large-scale “Socrates Café” – since there were about 500 people in attendance. “Which has been of greater benefit to the Arts – Invention or Imitation? Not a bad idea, for it one treats the alternatives as exclusive, one can go on debating it for centuries” (Part 1, Sept. 22). Another way of putting it: should one be a classicist or avant garde? Goethe makes the observation that “By and large, the advocates of Imitation received the greater applause because they voiced what the common herd thinks.” This may give the false impression among those not familiar with his body of work that Goethe fell on the side of Imitation. However, we must not forget that through most of his writing career Goethe was a neoclassicist. But he most certainly started off as an “invention” writer with The Sorrows of Young Werther. More, I think Goethe is correct in his observation that the alternatives are not exclusive. The best writers have invented new things precisely as they were imitating. Goethe certainly was one such writer. Shakespeare was another. Frederick Turner is yet another. They all drew on classical forms and ideas while inventing new forms and developing new ideas within those formalist constraints. I try. The combination requires an understanding that using classical forms is not constraining and that it’s not true that it’s all been done. Postmodern artists believe both – that classical forms are constraining and that it’s all been done. You would think that if you think that it’s all been done that you would just write in traditional forms and be a classicist, but that’s not what happened with the postmodernists. They somehow combined their attitude with a rejection of classicism and form. The result is the muddle mess that is postmodern art. I am reading Goethe’s Italian Journey and I must say that it is a true delight. Goethe is the perfect combination of brilliance and humility. He shows his brilliance constantly, from his observations regarding the geology of the regions through which he travels to his observations on the behaviors of the people he meets. With the former, even though he clearly demonstrates his breadth and depth of learning, you do not feel either lectured or condescended to by him. With the latter, you get insight and judgments combined with real respect for everyone, from pauper to nobility. He is a refreshing tour guide through Italy. Goethe is as correct now as he was in 1786. And if you read Italian Journey, you trust that Goethe truly is not disparaging anyone. Build a truly great, beautiful building in a city – how long before someone defaces it? And why would they? What is it that compels so many of us to see greatness and to want to bring it down a notch? Is it that beauty and greatness make us feel ashamed that we cannot rise to such beauty and greatness, so we turn around and attack and deface in order to bring the thing causing us shame down to our level? We seek to tear down anything and anyone that seeks to lift us up, to make us better. And we seek to raise up any demagogue who comes along and tells us the lies we want to hear. This is why politicians are popular and poets are not. But then, the poets have mostly become demagogues themselves. Our postmodern kitsch art is demagoguery run wild. It seeks to tear down all beauty it encounters and flatters us with lies, tells us fairy tales, and caters to our weaknesses. A poem or a building that gave people “a higher conception of themselves and a sense of the truly noble” would be attacked. And yet, this is simply how people are. And we shouldn’t be surprised. Does this mean we should give up? I think it’s clear Goethe would say, “No.” We should not give up. We should not surrender. We should, rather, continue to seek to ennoble our fellow human beings. We have given up too soon. People can be ennobled. I see it all the time. I see it happening throughout history. It is a slow, gradual process. Thus, it is ironic that artists and philosophers have given up on ennobling right when it’s working. Well, perhaps not all of them. While many of us may be like Goethe when he went to hear a popular singer, feeling that “As a “Bird” I feel I am a failure” (Part I, Sept. 20), it is often those popular works – pop culture – which manage to bring everyone else along anyway. This is perhaps precisely because pop artists respect the common people. Goethe seems to balance himself between the popular and higher values. His art was both extremely popular with everyone and extremely respected by artists everywhere. In this he is much like Shakespeare. They both shared a desire to raise people up, penetrating insights into human nature, and respect for people no matter their station in life. This combination makes them the greatest writers of all time. And this combination – or any one of them, quite frankly – is what is missing in postmodern art and literature. Only rarely have I come across it in any human being. * "Birds" is a reference to Goethe's play, an adaptation of Aristophanes' "Birds." It is well established that tragedies in their purest forms come during sharp cultural transitions. During the tragic age of the Greeks, that transition was from a shame to a guilt culture. As such, we should expect to see evidence of this transition in the works themselves. I recently discussed the fact that it has been discovered that experiencing the sublime creates awe, and this makes people feel more connected as a group. One of the purposes of tragedy was to create a feeling of group cohesiveness amongst the Athenians, who almost all attended the Great Dionysia each Spring. It has been suggested that the common experience of the plays helped create more social cohesiveness. However, what if it was the fact that the tragedies created feelings of awe that they created this feeling of social cohesiveness? And the light-hearted race of birds, and the tribes of savage beasts, and the sea-brood of the deep, he snares in the meshes of his woven toils, he leads captive, man excellent in wit. And he masters by his arts the beast whose lair is in the wilds, who roams the hills; he tames the horse of shaggy mane, he puts the yoke upon its neck, he tames the tireless mountain bull. And speech, and wind-swift thought, and all the moods that mould a state, hath he taught himself; and how to flee the arrows of the frost, when 'tis hard lodging under the clear sky, and the arrows of the rushing rain; yea, he hath resource for all; without resource he meets nothing that must come: only against Death shall he call for aid in vain; but from baffling maladies he hath devised escapes. Cunning beyond fancy's dream is the fertile skill which brings him, now to evil, now to good. When he honours the laws of the land, and that justice which he hath sworn by the gods to uphold, proudly stands his city: no city hath he who, for his rashness, dwells with sin. Never may he share my hearth, never think my thoughts, who doth these things! The word mistranslated here as "wonders" is a Greek work that simultaneously means "awful" and "great." The first problem is that "awful" only has negative connotations and English. One could perhaps solve the problem by rendering the Greek word "awful and awesome," except that "awesome" sounds frivolous to us in English. And saying "full of awe" doesn't catch the duality of the Greek. One almost wishes one could render it "awe-ful," but this would not solve the problem phonetically. It still sounds like "awful." Still, it helps us to read "Wonders are many, and none is more wonderful than man" as "Awe-full is the world, and nothing more awe-full than man." That is, the world is full of things that create awe -- things terrible and things wonderful -- but humans are simultaneously the most terrible and most wonderful of all. No creature is either as immensely destructive nor as creative as are human beings. The argument is that humans ought to feel the most awe when we are in the presence of our very selves. This argument ends up doing double duty. First, it addresses the issue of awe and the sublime. It thus works to make us feel small and reduces our egos. However, what is it that is sublime? Mankind itself. Thus, is raises us up, increases our egos. This tension makes sense if we understand the shame culture out of which Athens was evolving as being egocentric and the guilt culture into which Athens was evolving as being more collective-minded. More, it was Mankind against which one should compare oneself, and against which one's ego ought to feel small. This duality is perhaps why tragedies continue to fascinate us. The tragedies demand of us the simultaneous feelings of beauty and the sublime. They raise us up and make us feel small beside their grandeur. They individuate us and bring us together. Thus they achieve what no other art form can achieve by embracing only beauty or only the sublime. awe – more so than emotions like pride or amusement – leads people to cooperate, share resources, and sacrifice for others, all of which are requirements for our collective life. And still other studies have explained the awe-altruism link; being in the presence of vast things calls forth a more modest, less narcissistic self, which enables greater kindness toward others. So awe is good for bringing people together and making them more empathetic, which works to reinforce this feeling of togetherness. While the sublime creates awe and awe increases empathy and thus creates stronger social cohesion, the beautiful has been connected to virtue (Aristotle) and justice (Elaine Scarry). We have seen that beauty and the sublime are not the same (something also argued by Frederick Turner in his book The Culture of Hope). More, Paul Bloom recently argued that empathy and morality are not necessarily connected -- that"if you want to be good and do good, empathy is a poor guide." certain features of empathy make it a poor guide to social policy. Empathy is biased; we are more prone to feel empathy for attractive people and for those who look like us or share our ethnic or national background. And empathy is narrow; it connects us to particular individuals, real or imagined, but is insensitive to numerical differences and statistical data. That empathy is biased is in fact supported by Keltner's work. He noted that awe creates both empathy and a view of ourselves as members of collectives. This might be fine if we define ourselves as part of the human race, but it is certainly problematic if it causes us to more closely identify with more narrow definitions of the word "race." Empathy is equally felt more strongly for those we perceive to be more like ourselves. Which can in fact make us less ethical. Empathy is felt one-on-one, which means we act ethically toward the person we perceive, but it does not transfer to unseen people. In fact, empathy can lead to downright unethical -- or at least unwise -- social policies. Politicians tell stories to make us feel empathy precisely to get us to support policies that help that tiny seen minority of whom they are speaking, but harm the majority they somehow fail to mention. Truly ethical policies are founded on good data and good understanding of the social systems, not on special cases. Jesse Prinz also makes the argument that there is a difference between empathy and justice because, as he notes, we are often angry at injustice. Anger of course prevents us from feeling empathy, even as it may have some source in empathetic feeling. Anger prevents us from feeling empathy toward those against whom we are angry. In this sense, anger is dangerous. But one can also feel anger against discrimination and other inequalities, compelling one to try to do something against these injustices. Of course, one has to be careful here, as one should not act out of anger, even if anger is a good initial motivator. One should next try to find out what will in fact help rather than just go with whatever sounds good at the moment. Anger can over-motivate, causing us to act rashly. Aristotle comes in to save us here. Aristotle argues that virtue is a golden mean between two unvirtuous extremes. Courage, for example, is the mean between cowardice and rashness. So rashness is an extreme. Acting rashly is an extreme against we can compare inaction. The virtuous mean is informed action. Thus will we act justly in response to injustice. And we can see the role of anger -- it has to have a role for there to be action at all. If Bloom and Prinz are right, then in many ways morals and justice can be the opposite of empathy. They can be when we are talking about moral attitudes or justice toward out-groups. The experience of beauty makes us more likely to act ethically and justly toward others -- including Others. But the experience of awe makes us more group-oriented and more empathetic. And as we have seen, those two are deeply related to each other. The fact that the postmodernists have emphasized the sublime over beauty helps us to understand why they are also collectivists and embrace collective guilt as a social regulator. The feeling of God as sublime is also central to the creation of guilt culture. Coincidentally, Frederick Turner associates beauty with the feeling of shame. And the Greeks -- a shame culture -- did certainly emphasize beauty over the sublime. Except in their tragedies, which not coincidentally, were in the transition of Greek culture from a shame to a guilt culture. However, beauty makes a comeback during the Enlightenment, when there is a responsibility culture. I do not think it is a coincident that there is an emphasis on beauty which emerges in more individualistic, cosmopolitan periods, while there is an emphasis on the sublime which emerges in more collectivist periods. It seems that these things are all deeply interconnected. Opium puts people to sleep due to its "dormitive properties." This was how we used to describe how opium worked on humans. It is, of course, a tautology. Is a child having difficulty learning math? It is because he has Developmental Arithmetic Disorder. Let's ignore the fact that math is an artificial construct we must learn and which is not at all natural to the way humans actually think. It doesn't occur to anyone that it is those who know math best who are the weird ones. Disappointed you didn't win the lottery? Stressed that you did? You must have Lottery Stress Disorder! Never mind that disappointment is a natural emotion to feel when thing don't go your way. Never mind that all those idiot relatives you never heard of are suddenly coming out of the woodwork are trying to guilt you. Refusing treatment for circular disorders? You clearly have Noncompliance with Treatment Disorder (DSM code V15.81). When I was growing up, we just said the person was being bullheaded. Going to the doctor? Don't show up early, or you'll be diagnosed as anxious. Don't show up late, or you'll be diagnosed as hostile. Don't show up on time, or you'll be diagnosed as compulsive. Child not playing attention in our boredom factories, I mean, schools? Don't believe your child has ADD? Why, then you have Attention Deficit Disorder Denial Disorder. And I suppose that if you deny you have that, then you would have to have Attention Deficit Disorder Denial Disorder Denial Disorder. Unhappy for no reason? Perhaps you have Unmediated Depressive Syndrome. Do you like to drum your fingers on surfaces? You have Percussive Digital Disorder. Young at heart? You have Peter Pan Syndrome. But don't worry! For all of these and the irrational feelings you have when you have to deal with having a sadistic boss or cheating spouse or bureaucracy in general, there's a solution. We have a drug for that! Or, and here's an idea, that's just people being people. That's just life. Grow up. Stop complaining that your life is so good and that you are so wealthy that tapping your fingers is a disease! Should Being a Jerk Be Illegal? I was once asked a question that was obviously designed to test my "libertarian purity": What is the difference between me shining a light onto my neighbor's property and painting pictures of naked people on my fence so the neighbor can see it? (This assumes, of course, the neighbor would find the painting offensive.) He proposed there was no difference, as light must cross property, regardless. However, I propose that there is a marked difference. If we take the issue of the light itself, there is a difference between the purposeful directing of the light toward the neighbors and the incidental reflection of the light from off of the painting. This parallels the distinction made in the famous "Trolley Problem." In the Trolley problem, people will switch the tracks to redirect a trolley to kill one person to save three, but they will not push one person onto the tracks to stop the trolley to save three. It turns out that people find bad outcomes that are incidental to a decision to not be unethical, but do find bad outcomes built into the decision to be unethical. It seems to me that a light I direct into the neighbor's yard so that the neighbor is aggravated by the light and cannot sleep to be of the latter kind, while a painting whose reflected light enters a property to be of the former kind. But the issue with the painting is itself incidental to the light involved. True, we need light to see it at all, but the point is the images. The issue with the images involves the neighbors taking offense. But here we see that the person who painted the images is not responsible for the reaction of the neighbor. It is the neighbor who takes offense, so they are the ones responsible for their own reaction. There is nothing inherently, objectively offensive about an image -- offense is always subjective. The directed light, however, can have an objective consequence in its disruption of circadian rhythms. The neighbor's plants can be negatively affected, let alone the neighbors themselves, whose sleep could be disrupted, whose eyes could be damaged by the intensity of the light, etc. The neighbor could, of course, take measures against the light, but such measures cost the neighbor. If I run into another car, I have to pay for repairs because the person now has to buy things they did not have to buy absent my actions. Again, the painting costs the neighbor nothing, as they can avoid looking at it by simply averting their eyes. Both behaviors may make me a jerk -- meaning I am acting in an antisocial manner -- but the real issue here is which of these should require an act of legislation. For my money, legislation should only exist to counter some kind of objective harm to the secondary party. Disrupting one's circadian rhythm certainly qualifies. Doing something at which someone may or may not take offense does not. The latter is purely subjective -- it is "harmful" because the secondary party chooses for it to be harmful to them. That is certainly not the fault of the primary party. However, if I want to be a member of a certain society, then I should try to abide by that society's rules -- or go join another one with whom I can better get along. But legislation is one thing; rules are another -- and being a jerk shouldn't necessarily be illegal. Eros and Eris are twins, a fact not known to Hesiod, who did nevertheless accurately record Eros' dual birth from the primordial chaos and from the coupling of Aphrodite and Ares. Love from love and war -- indeed. But Eris too was born from the chaos, else nothing else would have been born into the world. Apollo and Demeter -- the constant sun and changing moon; the source of light and light's reflector -- were not the only complementary opposites. It is easy to love both love, light and constancy, but who's prepared to love strife, shadows, and change? We wish to love one but not the other, but if love were the ruler and the rule, the universe would have collapsed before it began, all attracted to all. Strife pushed everything apart, made everything possible by separating and giving them identity. But strife alone brings us entropy and death. Separated, love brings us together; together, strife pushed us away. When they work together, we get a dynamic push and pull that allows us to orbit each other, stably one and separate, identical with identity. When there are two entities, the two enter a stable orbit -- when there are three, we get chaos. We miss the presence of strife as much as we do love. We feel the pain of love's absence -- that pain is well known, well recorded in our stories and poetry -- but we rarely speak of the pain of strife's absence. But when we feel her absence, we call her to us as to a lover. A person without problems will create them for himself, or imagine problems not present or as bad as he imagines. Give a man a perfect job, perfect family, perfect income, perfect friends, perfect things, and he will pick a fight with a coworker or his wife, squander money on gambling, mistresses or prostitutes, do drugs or drink to excess, and thus lose the perfection in his life. Or, he will externalize the problems and find problems in the world that aren't there, or magnify flaws in the society that took all his problems away and declare those flaws inherent to that system, and only to that system. People will always find and resurrect strife -- she is much too loved. And she should be loved. We seek her because we understand, deep down, that strife is as natural a part of the world as love. They are natural partners, attraction and repulsion working together to create dynamic, complex, evolving systems. Without the pair there is neither production nor reproduction, creation, recreation, nor procreation. Art and literature rely on their mutual actions. Politics, society, and economy require both to exist at all. They are one of the paradoxical pairs which constitute beauty itself. When we deny either love or strife, they return to us in unhealthy ways. Deny love, and you will love the wrong people or things. Deny strife, and you will create it for yourself. Understand the importance of the two, and they will contribute more to your live than you can imagine. Deny them, and they will destroy you. As love transforms itself from Eros to Philia to Agape, so too does Strife follow suit, becoming ever-less personal. If we can learn to love all mankind, the strife there too much be transformed to be world-society--creative. Can we not criticize with love, desiring through critical strife to transform the ones we criticize? And can we not be open to such criticism ourselves? But it need be from love, for without the condition of love, criticism seeks not to transform, but to simply destroy. The word "allowed" here needs clarification. Today we use it to mean social pressure. You are not "allowed" to criticize someone based on their race, gender, religion, etc. in certain circles -- but no one is going to do much other than engage in social ostracism. One could write a racist play, but who will perform it? And when it comes to racial/ethnic criticism, some groups can do it while others cannot -- with "can," again, being understood as "and avoid negative social consequences." In civilized society, one cannot criticize racial minorities, ethnic minorities, or homosexuals -- but this hardly means we are ruled by these groups. But I think we could certainly argue that those who enforce these social rules -- those with egalitarian psychologies -- do in fact rule the West. Voltaire means "allowed" in this much stronger sense. While egalitarians are not likely to engage in outright violence to enforce their world view and not allow you to criticize it or what they find sacred, authoritative psychologies are (at least, if their culture or subculture supports it). You have to understand that for authoritative psychologies, threatening what they believe is to threaten the world as a whole. If you don't fit in, you must be rooted out. Violently, if necessary. Medieval society was authoritative -- a guilt culture -- and thus people in it with this psychology supported such things as death for apostates and critics of the dominant world view. This is where Islam is now. Certainly not all -- or even a majority -- of Muslims, of course, but neither was this the case in Medieval Europe among Christians. The people who in fact engaged in things like the Inquisition were few, but they were those with power. Had they not had power, Medieval Christians would have likely tried to seize it in rebellious acts of violence. Many people think that sensitivity to criticism means one is weak in one's belief. Nothing could be further from the truth. It is the true believers, those with no doubts whatsoever, who are most dangerous and most willing to engage in violence to protect those beliefs. Doubts, skepticism, uncertainty in fact make one less likely to engage in violence. This is why your postmodernist welfare state supporter doesn't engage in violence, but your Marxist will. Christians are, mostly, in the position of the postmodern welfare state supporter. They mostly believe in God, but they do not live as though everything they do could or would be judged by God. Most Christians are believers in responsibility -- and belief in responsibility means belief that your moral actions emerge out of yourself. Medieval Christians were believers in guilt, which stems from violating God's law. If you really want to understand Medieval Christianity and contemporary Islam, just look at the way our police behave in regards to law enforcement. They are the enforcers of the law, just as was the Inquisition. Their job is to ensure that you never violate the law, no matter what that law may be. This hardly means police are above reproach, though. Indeed, in this country, one can criticize the police. And the law. And politicians. Does this mean that they do not rule us? The one with the power, the one with the guns and is willing to use them, is indeed one's ruler. We shouldn't be mistaken about this. So why does out government allow criticism? The postmoderns have discovered a kind of power that can be best held through allowing people to criticize. You allow people to criticize, you give people the appearance that what they say matters, and in exchange you get to keep all the power you want. But of course, all real criticism is ostracized, kept out of polite company, marginalized. It is a different tactic, but it ends up having the same result of silencing opposition. Better, they get you to censor yourself, so you don't even know you're being ruled.